Cover by Dario Brizuela and Franco Riesco! What better way to escape those awkward political arguments with your uncle this Thanksgiving than by retreating into the wonderful world of comic books. Teen Titans Go! # 31 debuts this week, and it's one on my favorite stories to date. Agnes Garbowska handles the art chores from my script, with colors by Franco Riesco, letters by Wes Abbott and edits by Kristy Quinn. 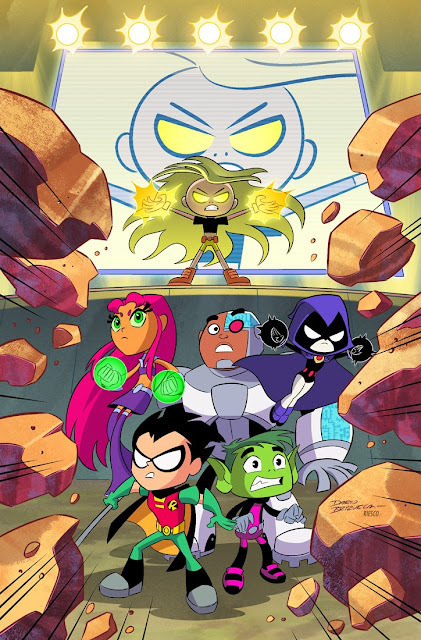 When Robin catches Starfire, Raven, and Cyborg making paper airplanes, he warns them that they’re dangerously close to unlocking “The Deadliest Art”: origami. Find it at your local comic shop this Wednesday, or grab a digital copy now at comixology.